Publishing her work in a new peer-reviewed scientific textbook, Dr. Indrani Roy, a solar and climate scientist, has determined there is a “robust solar signal on climate” with observational results affirming the solar signature on sea surface temperature and annual mean air temperature. Isn’t it amazing how the big yellow ball in the sky influences our climate? Certainly not the IPCC and their army of increasing irrational climate “modellers”. If a science fiction writer had been bold enough to write, not about how to time travel or how to warp drive to the ends of the universe, but only about how to con people into thinking reality was different from what it is, who would have bought THAT ?! And, now that government owned “scientists” are claiming that, most people to their credit don’t believe it. Yeah but its only lit up for about half a day every day. Actually, where I live, in summer the best you can get is 8 hours with only 6 of that usable. So it’s really only about 1/4 at best, because with cloud cover, which we get a lot of in the summer, you can lose some to all of that. I can charge my phone with it, in a pinch. But I wouldn’t want to have to rely on it to cook my food or keep my fridge and freezer running. Are you saying the Sun is causing the current warming (since the 60s/70S)? Or are you just saying that climate generally varies with what the Sun does? Captain obvious or climate science denial … which is it? P.S. : Why is the temperature increasing with decreasing solar output? Why is the stratosphere cooling if it is the Sun? Of course the Sun was partly responsible for the warming during 1970s to 1998. During that period, the solar cycles were pretty strong and hence obviously had contributions. SebastianH, it shows you have a very little knowledge about the complex areas of sun climate studies. The climate is unlike to follow a linear releationship with the sun all the time. There are many other dynamic complex coupling involved. Hence no point in using a term ‘Climate Science Denial’. You need to fight with science! On your question ‘Why is the temperature increasing with decreasing solar output?’ – There were strong solar cycles during strong warming period. But then warming Hiatus period started since 1998. CO2 increased at a very significant rate though global temperature did not follow that trend. Interestingly, models showed that significant rise in temperature. The current solar cycle is very weak and hence it must have contributions on warming Hiatus! All studies suggest model based CO2 can never be the driver of global temperature. On the other hand it shows we are underestimating influences of the sun. As you constantly point out to everybody, there is absolutely zero evidence that CO2 effects climate in any way. There hasn’t been any warming except for a large El Nino release, since after the last El Nino release. You do know that around the 1970’s was the coldest period since the LIA don’t you, seb. Why aren’t you moving to Siberia if you want LIA conditions? The TINY ocean warming can only have come from the SUN, (or possibly volcanic activity) because there is no real (as opposed to seb fantasy fizzics) mechanism by which CO2 can warm the oceans. Seems you have zero comprehension of how the stratosphere relates to the surface temperatures. Yet again we see that the sun is the drum-beat to which our climate marches, not CO2. Dr I. Roy is a climate scientist and undertook a PhD at Imperial College, London, within the Space and Atmospheric Research Group. Has also worked in various research organisations including Imperial College and the University of Exeter, as well as also previously worked for the Indian Meteorological Department. Researching areas interest including solar variability, QBO (Quasi-Biannual Oscillation), ENSO (El-Niño Southern Oscillation), other major modes of­ climate variability, stratosphere-troposphere coupling, ocean-atmosphere coupling, climate change, and monsoon. Also Dr I. Roy is a reviewer of many international journals including Nature GeoScience, Nature Scientific Report, Frontiers, Tellus and Climate Dynamics among others. So this is evidence that there are scientists qualified in the field who can see beyond the CO2 nonsense that is proffered as science. May they all go on to write more scientific papers. Hopefully, someone can find the full paper so you can learn more about this. As an example for similar robust signals you can take the CO2 concentration. It varies over the seasons and with El Ninos/La Ninas. They leave a pretty strong signal in the data, but the general increase is nevertheless caused more or less what humans emit. So of course you can see the solar cycle fingerprint in the climate, but that is not what caused the warming in the last decades. Otherwise, you’d have to explain how a weakening Sun does perform this miracle. No silly boy the sun beats out the rhythm and metre of the climate not CO2. It has warmed this planet quite gently since the LIA to where temperatures, quite naturally are today. As usual you are way off the mark! All your blather about the 1960/1970 show that you are totally unfit to discus climate, just as you have proven with your nonsense about chaos theory. We skeptics do not accept your supposition about man-made climate change because there is no evidence that it is happening. Please show where CO2 warm the atmosphere. This is funny because you think you have a clue. First the defintion of a second thing, now this about chaos and finally misunderstanding what signals in data mean. We skeptics do not accept your supposition about man-made climate change because there is no evidence that it is happening. Please enjoy your retirement and stop bothering us with your beliefs about what is happening and what is not happening. Who is the ‘us’ in your statement?. Surely as usual you are only writing about yourself. Your belief system SebastianH, which lacks any coherent science base, or observational evidence that CO2 does anything detrimental to the atmosphere or biosphere, must be countered. And considering I have the luxury of much time on my hands to investigate not only your blather but also the real science (not your IPCC inspired fake belief system), I shall enjoy countering you as I see fit. You are the clueless opinionated one one, unerringly depositing nonsense on this blog. I sure you enjoy it but I enjoy countering you. seb, please enjoy your pre-pubescence (you are stuck with it for life), and the rest of your time in Junior High. The warming since the 1970s can be explained by enhanced absorbed solar radiation modulated by the decreasing decadal-scale trends in cloud cover — +2.3 W m-2 during 1979-2011. Fewer clouds means more solar radiation can heat up the oceans. The decreasing cloud cover in the Northern Hemisphere also explains why the Greenland ice sheet lost mass since the 1980s. But do explain why you believe humans are 100% responsible for the overall temperature trend of the last few decades anyway. So if cloud cover reduced while the TSI got weaker … how does this cosmic rays cause cloud cover changes thing work again? If you can explain why you always leave out half the equation? Clouds do not only block sunlight, you know? And who knows, maybe clouds are a feedback to changing climate and not a cause? Or do you still think cloud cover is externally forced by cosmic rays? To what percentage? That is why you continually RUN AWAY from producing evidence or answering two simple questions. You have been asked MANY time to explain, backed by empirical science, how CO2 causes warming. This same researcher has a very interesting paper on “Solar cycle variability can modulate winter Arctic climate” that you might also be interested in. 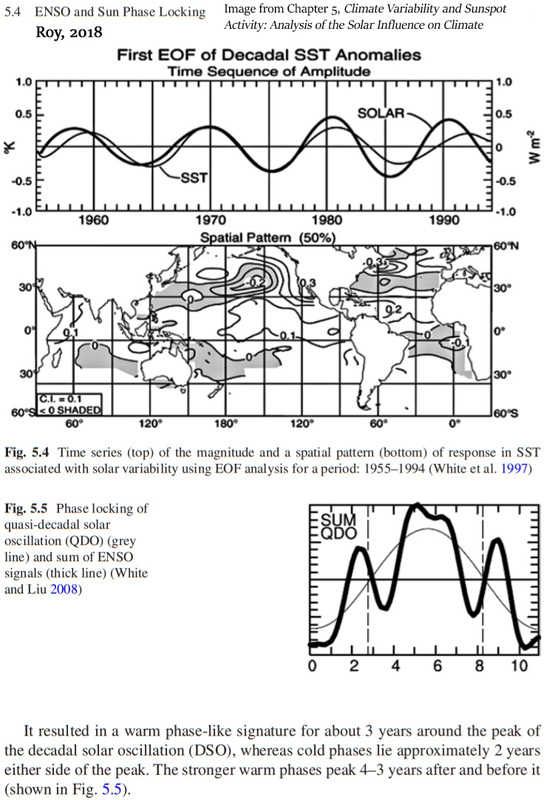 Figure 5.4 (top) clearly shows that solar and SST are NOT in sync … ANY two such EOFs will be in phase somewhere. However, so will any two sine waves … so anyone who finds that fact significant is not following the story. Fig 5.4 shows Solar leading SST by an average of ~1 yr. Solar cycles 23 & 24 have also behaved the same way. Congrats to the author for also confirming the solar cycle influence on the ocean. My fig. 18 also shows ocean & ENSO indices lagging solar indices. The climate follows equatorial OHC, following solar cycle TSI. The wave of ENSO (La Niña – El Niño) can develop when the jet stream is a latitudinal. This is what happens when the solar wind is strong. SebastianH your comments show you do not have slightest knowledge about the sun climate studies. Here is a review work on that which got 793 citations. Are those renowned scientists ‘climate science denial’ according to you? Many are even IPCC lead author!! It discussed all robust solar influences and of course seperated ENSO, CO2 signals to show solar signals. SebastianH, of course the sun is partly responsible of the warming during 1977 to 1998. Solar cycles were very strong during those decades. Recent weaker solar cycle is also partly responsible for the warming ‘Hiatus Period’ since 1998. CO2 has increased at a very significant rate since 1998 but global warming trend did not follow that. Hiatus period showed CO2 is not the main driver of global temperature! Interestingly, models showed significant rise in both CO2 and global temperature since 1998!! Reality shows a long Hiatus followed by a ocean release. CO2 cannot and does not warm oceans or stop them cooling. The models are based on the erroneous science of CO2 warming. Hiatus, shmiatus. It’s getting cold. CO2 has increased at a very significant rate since 1998 but global warming trend did not follow that. Of course it did. Do you think the warming caused by CO2 affects the atmosphere only? The sea level continued to rise, OHC continued to rise and Arctic ice continued to melt. Why continue to PARROT your continual LIES, seb ?? OHC.. a rise of 0.08ºC globally, maybe, since the 1950’s, according to NOAA. Do us a favor and show us your math skills by calculating how much forcing in W/m² that “tiny amount” equals. Do us a favour and try to understand just how TINY a change of 0.08C since the 1950’s is. Good think volcanoes aren’t warm, hey. Really????? quoting gistemp . . . ROFLMAO. We are talking about sea temperatures, you poor headless chook. Data makes the Arctic sea ice steady for 12 years, ignoramous. No SebastianH, there is no evidence that shows that! Sure … you can believe whatever you want, tomOmason. SebastianH, And your beliefs make you look very silly — weather effect are now climate, eh? I thought you agreed that CO2 rise happens 500 to 800 years after a warm period, or (like most cAGW advocates) are you just changing your tune to suit your message? There’s a good reason why most Westerners don’t trust the Warmunistas. A very basic question you need to answer. How atmospheric warming in last two decades that happened due to CO2 can suddenly switch to Arctic warming and sea level rise in 1998? What mechanism supports such CO2 behaviour? Sorry, it would be ‘….last two decades of the 20th century….’.